If you have any news to submit to us that we haven’t covered, including announcements or press statements, please email us here at editor@bailieborough.com We would be glad to hear from you. Bailieborough News. July 9th 2018. Matthew J. Cullen. This is the final event of the World Meeting of Families 2018 and is the only event where some tickets are still available to see Pope Francis on his visit to Ireland. The Meeting in the RDS on the 22nd, 23rd and 24th is booked out as is the visit to Knock Shrine and the Festival of Families in Croke Park on the 25th. The original bus that was organised from the Parish to travel to the Phoenix Park is almost full. We have booked another smaller bus with 15 seats and 15 tickets for the Papal Mass. If you book a place on the bus, you will receive a ticket for the Mass. You don’t need to go online to book. The tickets are free and will be available to collect closer to the event. A small donation towards transport may be taken up on the bus. Please call the Parish Office at 042 9665117 during office hours (Monday, Tuesday and Thursday: 10am to 3.30pm and Friday, 2.00pm to 6.00pm.) to book your place and your ticket. 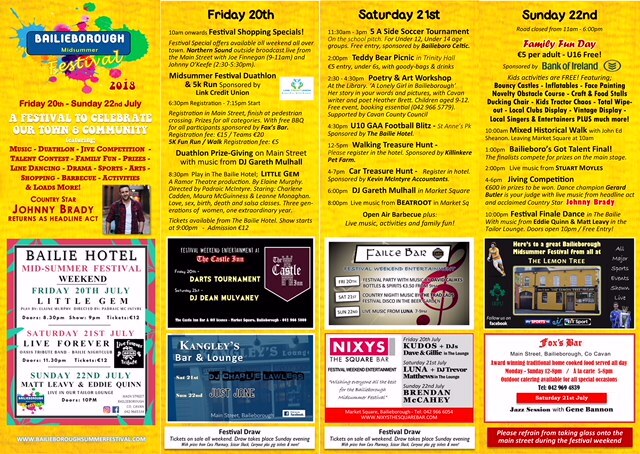 Bailieborough Mid-Summer Festival will be taking place from Friday, 20th of July until Sunday, 22nd of July. This year we will be holding a Vintage Car, Bike, Tractor and Lorry display. Please note, there is a limited entry to this event. Anyone interested in bringing a vehicle, please contact 087-7964844. All entries are free. We are Delighted to announce ‘Little Gem’ will be coming to the Bailie Hotel on Friday, 20th July at 9.00pm. Directed by our local star Padraic McIntyre. Tickets are available from the Bailie Hotel reception at only €12. Our Midsummer Festival Duathlon is back on Friday 20th of July. This year, there are new exciting routes to suit all levels. Also there will be a 5k Family Walk or Run, followed by a BBQ for all participants, sponsored by Fox’s bar. The event will start and finish on Main Street. Ger Butler will also be Joining us with Elite Country Radio. Also after last year’s success our Jiving Competition is back, great prizes up for grabs!! Not long now until Johnny Brady takes the stage, from 4-6pm on Sunday 22nd of July. A fun-filled weekend for all the family, the Festival will commence on Friday 20th until Sunday 22nd and for further details see next week’s issue of the ‘Celt. Congratulations to Bailieborough Shamrocks Camogie Club, who are County Junior A League Champions following a comprehensive win in the County Junior A League Final held in Drumgoon on Saturday evening last. The girls won on a scoreline of Bailieboro Camogie: 5-10 (25) to Kill Camogie: 4-4(16). Congratulations girls on a terrific achievement and also well done to the managers, mentors, players and everyone associated with this terrific win. Wednesday, July 11th – Dun A Ri Forest, Kingscourt (M) Walk – 1.5 hours. 5km Forest Walk. Commencing at Cabra School entrance to Dun a Rí Forest Park, Shercock Road, Kingscourt at 7.15pm. Leaving Bailieborough Library at 6.50pm. July 18th– Maudabawn/Mayo Hill: (A)Walk 2 hours. Leaving Bailieborough Library at 6.45pm. Meet at St. Patrick’s Church, Gallonreagh, Maudabawn. Walk commence at 7.15pm. Follow the R191 Canningstown /Cootehill Road for 10.5km. Turn right at sign for Maudabawn. All welcome. A Pilgrimage to Knock will take place on Sunday, July 15th, leaving Shercock at 8.30am and Bailieborough at 8.45am. The fare is €20. Contact Geraldine at 087 964 3884 for further details after 6.00pm. 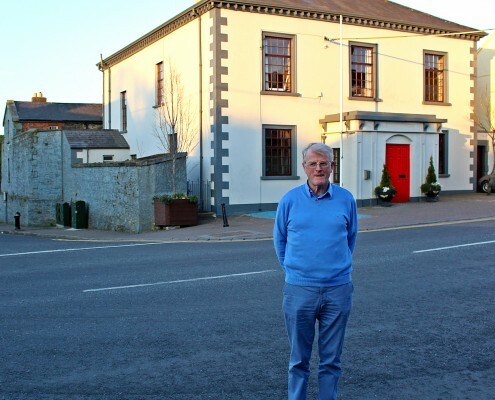 Bailieborough Tidy Towns request that all business, property and home owners would help out, by giving their property a face lift in preparation for the Tidy Towns Competition. The local ‘Clean Up’ continues on Tuesdays at 7pm. All welcome. Complimentary food, drinks, tea/coffee will be available between 12 noon and 4.00pm, on Friday, July 20th. All are most welcome to call in. Beginners Yoga takes place every Saturday morning between 9.30 and 10.30am, in Bailieborough Leisure Centre. €60 for six classes/€12 per ‘drop-in’ class. Contact Darren at 086 846 9581 or email darrenclarke@campus.ie for further information. Bring a yoga mat, an open mind and wear comfortable clothing. Safepass on Saturday July 14th from 8am -4pm, lunch included €100 at Bailieborough Business Centre. Please call 042-96 94 716 for further information. Lotto results for 07-07-2018. Numbers Drawn; 1, 10, 15, 18. No Jackpot Winner, Lucky Dip (€25) Winners; Brid Murray; Martin and Patricia McGuirk; Gerry Sheanon; John Reilly. Jackpot next week, €3,700. New members always welcome to the Heritage Society, please contact 0872244159 for further information. Many thanks to all those who were involved in the Parish Family Mass on Saturday evening, June 30th to prepare for the World Meeting of Families. Thank You to the families who did the opening procession of symbols, the readings, the prayers of the faithful, the offertory procession and the post communion reflection, to the Choir for their lovely contribution to the liturgy, to the Pastoral Council who organised the event and kept a watchful eye on the bouncy castle, to the ladies who baked buns and to Fox’s Catering for providing the refreshments. We are getting ready for Heritage Week 2018, August 18-26. If you are interested in or planning hosting a heritage event, contact Cavan Heritage to be included in our Local Heritage Week Guide. The Blessing of the Graves will take place in Killann on Saturday, August 18th at 7.00pm, in Shercock on Sunday, August 19th after 11.30am Mass and in Bailieborough on Sunday, September 2nd at 12 noon. Scouring of the lines continues and will be carried out until this Friday, July 13th. This may cause some disruption to member’s water supply. Should any problems arise, please contact the Maintenance Officer, Seamus McCabe on 086 0466 188. We regret any inconvenience this may cause. Bailieborough 10:45am – Morning Prayer, followed by tea and coffee. United Service in Knockbride 10:30am – All-Age Service followed by tea and coffee. will take place from 4th – 7th October 2018. Poets definitely taking part are Annemarie Ní Churreáin, Enda Wyley and Brendan McCann. Watch out for full programme soon. Baptism Dates in St. Annes for July, August, September and October 2018: The following are the available dates for Baptisms in St. Anne’s Church–July 15th (Sunday, 12.30pm), August 11th (Saturday, 1.30pm), August 19th (Sunday 12.30pm), September 15th (Saturday, 1.30pm), September 23rd (Sunday, 12.30pm) October 6th (Saturday, 1.30pm) and October 28th (Sunday, 12.30pm). Training Monday 6.45 in Killann. New hurleys can be collected also new helmets for those who ordered. Game Friday for U9/11s in Clontibret. A holiday depleted side fell to defeat to Naoimh Moinne in the semi-final of the Tain league on Monday last. The lads gave a good strong performance and they did very well to reach the semi-final in the first year of this new competition. Attention now returns to the Monaghan league. 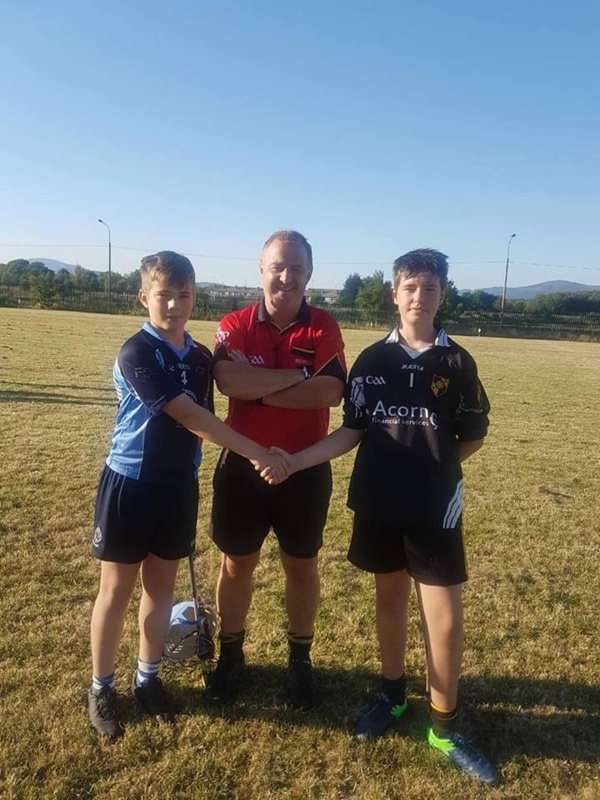 Daire Carolan captaining U13s in semi-final on Monday last. 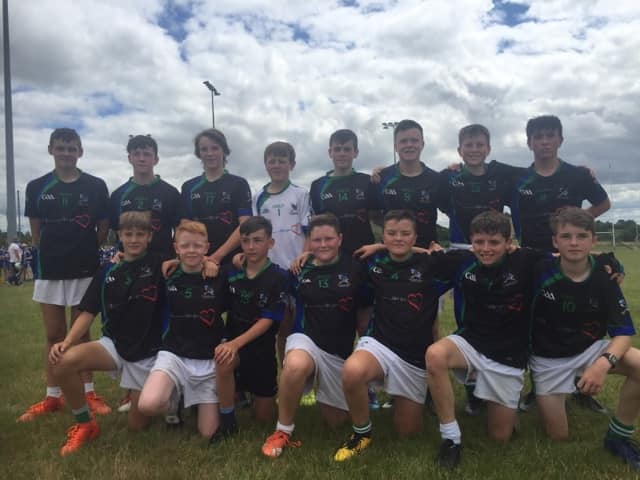 East Cavan Gaels men on the Under 14 panel who had three very good wins over Monaghan, Fermanagh and Armagh in Cloghan on Saturday last. ECG Callum Shiel (r) captained Cavan U14s on Saturday last. Above; Cavan U14 Development squad. Friday; U9/11s away in Clontibret 6.45 start. Includes clay modelling, painting on canvas, drawing techniques, designing t-shirts and lots more! SUMMER CRAFT and GIFT FAIR, Sunday 15th July, 12.00pm – 5.00pm, Slieve Russell Hotel, Ballyconnell, Co. Cavan. Join us for our annual summer fair, a whole host of handmade crafts, quality giftware and craft supplies. Free admission. For details downlandcrafts.ie or 049 436 4877.
http://bailieborough.com/wp-content/uploads/2015/09/bborocomlogo2015-300x130.png 0 0 Lee McDonnell http://bailieborough.com/wp-content/uploads/2015/09/bborocomlogo2015-300x130.png Lee McDonnell2018-07-11 14:00:562018-07-11 14:00:56Bailieborough News. July 9th 2018. Matthew J. Cullen. Bailieborough News. July 2nd 2018. Matthew J. Cullen. During the past few days, the Parish has organised a bus to travel to the Phoenix Park for the Mass. There are still some places available on the bus. If you book a place on the bus, you will receive a ticket for the Mass. You don’t need to go online to book. The tickets are free and will be available to collect closer to the event. A small donation towards transport may be taken up on the bus. As the Parish Office is closed until Monday next, July 9th, please call 087 4407 990 during the week to book your place and ticket. If there is no immediate reply, please leave a message with your name and number. St. Benan’s Pastoral Area Pilgrimage to the World Meeting of Families: Booking has now stopped for the Pastoral Area Pilgrimage to the World Meeting of Families in the RDS, Ballsbridge, on Thursday August 23rd. The bus from the Pastoral Area to the RDS on that day, for those who have already booked, is free of charge. Details of the departure times and locations will be announced later. Tickets will go on sale this week from the Bailie Hotel reception at only €12. Only 18 days until Johnny Brady takes the stage, from 4-6pm on Sunday 22nd of July. Congratulations to the East Cavan Swim Club swimmers who have qualified for the Irish National Division 2 Championships in Limerick this weekend – well done to Finn Longmore, Kelsey Buckland, Katie Mulvey, Sorsha Cooney and Kate Kierans. Fantastic achievement for all the swimmers and best of luck to those competing. Wednesday, July 4thth – Trim Castle (A) Walk 2+ hours (approx). Leaving Bailieborough Library at 6.15pm. Meet at Trim Castle Carpark. Walk commences at 7.15pm. Wednesday, July 11th – Dun A Ri Forest, Kingscourt (M) Walk – 1.5 hours. 5km Forest Walk. Commencing at Cabra School entrance to Dun a Rí Forest Park, Shercock Road, Kingscourt at 7.15pm. Leaving Bailieborough Library at 6.50pm. All welcome. Lotto results for 30-06-2018. Numbers Drawn; 05, 08, 10, 16. No Jackpot Winner, Lucky Dip (€25) Winners; Oliver Cooney; Pat Gaffney; Brian Murray; Derek R Smyth. Jackpot next week, €3,600. The Bailieborough Church of Ireland Annual BBQ will take place on this Saturday, July 7th from 5.00pm onwards in the Church Hall. Please come along and bring your friends—everybody very welcome. The Bailieborough branch of the Irish Red Cross will be hosting their ‘Tea Party’ on Thursday, July 5th at 6.30pm, in the Bailie Hotel. All welcome. Scouring of the lines has commenced and will be carried out until Friday, July 13th. This may cause some disruption to member’s water supply. Should any problems arise, please contact the Maintenance Officer, Seamus McCabe on 086 0466 188. We regret any inconvenience this may cause. Knockbride 12noon – Holy Communion. Bailieborough Poetry Festival 2018 will take place from 4th – 7th October 2018. Baptism Dates in St. Annes for July, August, September and October 2018: The following are the available dates for Baptisms in St. Anne’s Church–July 7th (Saturday, 1.30pm), July 15th (Sunday, 12.30pm), August 11th (Saturday, 1.30pm), August 19th (Sunday 12.30pm), September 15th (Saturday, 1.30pm), September 23rd (Sunday, 12.30pm) October 6th (Saturday, 1.30pm) and October 28th (Sunday, 12.30pm). 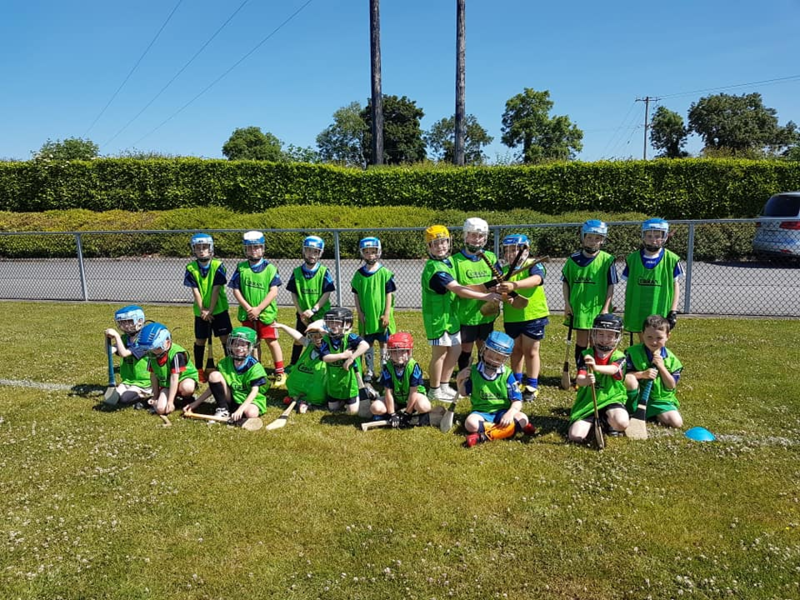 The lads had a great blitz in Inniskeen last week with U7 and U9 games v Inniskeen, Carrick, Blayney and Knockbridge where everyone performed very well in the sunshine. No training this week. Cul camp in Kingscourt. Training Monday 9th in Killann. 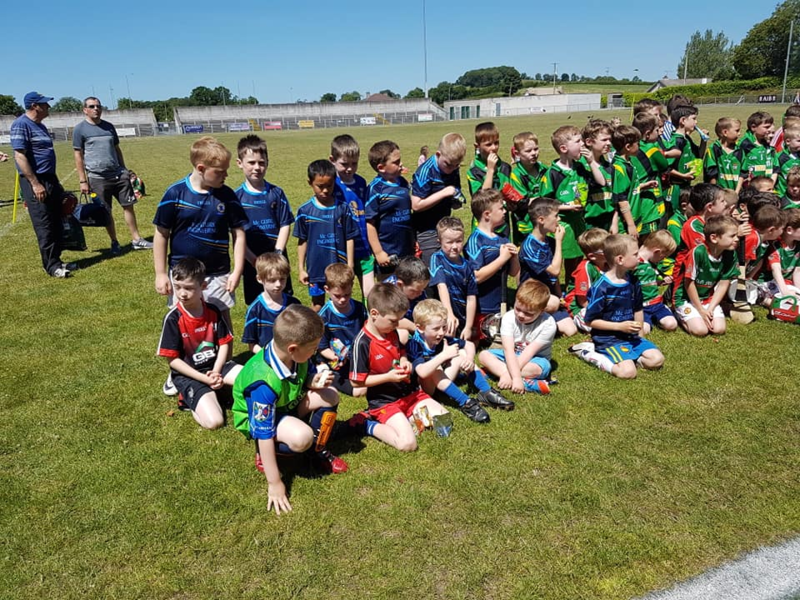 The U7 and U9 teams in Inniskeen last week. The lads play Naoimh Moinne from Dundalk in Dundalk on Monday 2nd in the semi-final of the Tain league. Best of luck to all. 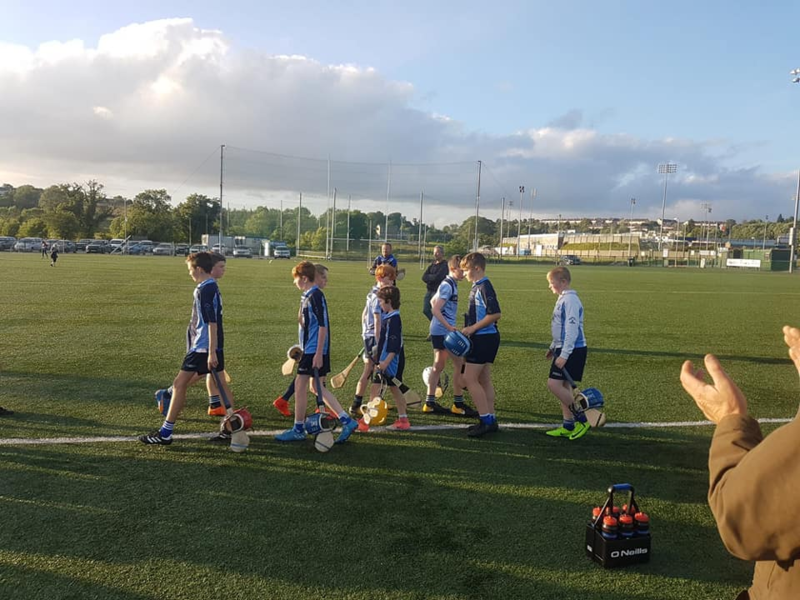 U13s after Longford Slashers game last week. A good performance although not the right result in going down by four points to Carrick in the Monaghan league. Missing a few regulars due to the holidays. Home to Cootehill Monday 9th July. U14/15; Pat O’Flaherty 087 450 1524. 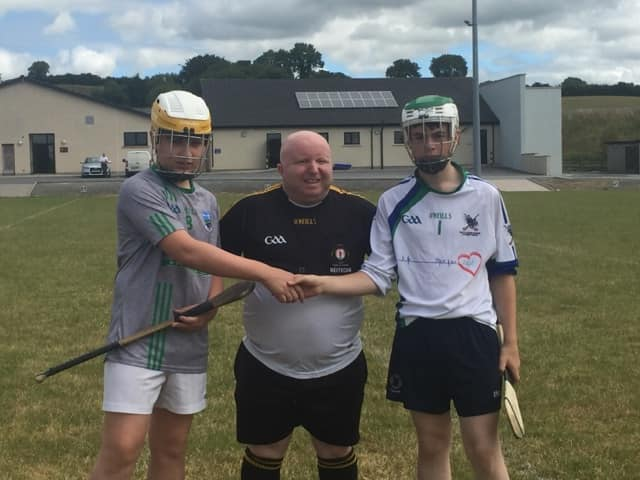 U14/15/17; Kathryn O’ Flynn 087 244 1371.
http://bailieborough.com/wp-content/uploads/2015/09/bborocomlogo2015-300x130.png 0 0 Lee McDonnell http://bailieborough.com/wp-content/uploads/2015/09/bborocomlogo2015-300x130.png Lee McDonnell2018-07-04 10:36:572018-07-04 10:36:57Bailieborough News. July 2nd 2018. Matthew J. Cullen. Bailieborough Notes is sourced each week from Matty Cullen and is not written by the admin team at bailieborough.com. If you have any other news you wish to be posted on the site, please get in contact with us here through Facebook, Twitter, by contacting us directly via email at editor@bailieborough.com or by phoning (042) 969 4716. Other local information from further afield can be found at TheAngloCelt.ie.